less is more: boozy brooklyn. This past Sunday R and I drove out to Williamsburg in Brooklyn to go on the Urban Oyster tour of the Brooklyn Brewery, which he got me for our anniversary. 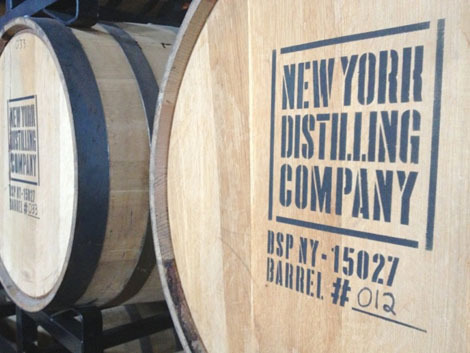 Little did I know, this tour was also of the Brooklyn Winery and the New York Distilling Company as well. This kind of screws up my plans for a day at a vineyard, because I was apparently wrong about where you should go to taste wine, but I'll explain later. The tour started at the Brooklyn Brewery, where we got a mini tour of the machinery in the back and it was explained to us and our six tourmates how beer is made. I went on a similar tour in Colorado, so the fact that we were ten minutes late (oops) wasn't a huge deal. After that, we were brought to the tasting, which was obviously the best part. 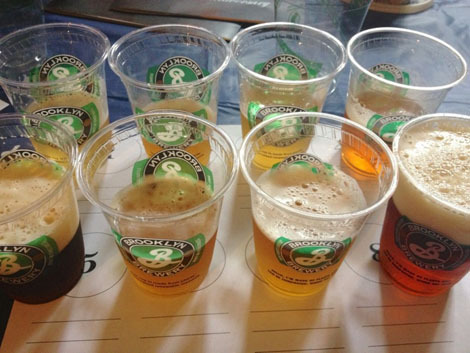 We were given tasters of eight different beers, including a 'brewmaster's reserve' beer that will be gone forever after it's limited appearance. The beers included (from left to right, top to bottom) the Halfling, Brooklyner Weisse, Brooklyn Radius, Brooklyn Lager, Brooklyn Brown Ale, Scorcher #366, Sorachi Ace, and the 'I Wanna Rye It', which is a hilarious name, but a really heavy beer, which is not my thing. I should have mentioned in the beginning of this that I really am not a beer drinker. I prefer cider when I have to drink a beverage like this, but really I'm a wine and tequila girl, so I went into this keeping an open mind, yet knowing my own preferences. I ended up falling in love with the second sample, the weisse, probably because it's made with the tastes of bananas, cloves & melon. Yum. I also really enjoyed the Scorcher (the brewmaster's reserve), which is a shame because it is so limited, and the Sorachi Ace, even though that was on the heavier side as well. The Halfling tasted just like any other beer, the Radius was similar to the Weisse but lacking some of the flavor, and the Lager was boring to me, as was the brown ale. I think they did a really good job impressing me though, and I liked a lot more than I thought I would. While our tour guide was speaking about the beers and the brewery's history, we drank our samples and ate thin crust Brooklyn style pizza from Fornino's, which was quite possibly the best part. After the brewery we walked over to the Brooklyn Winery, which was my favorite of the three places. I love wine so much, and our tour guide from the winery was amazing. She knew so much about everything, she was funny, and she let us peek into the room that a wedding was going to take place in later that afternoon. [One of the things she explained was that a vineyard and a winery are two seperate things, and they are not necessarily next to each other, and rarely are. 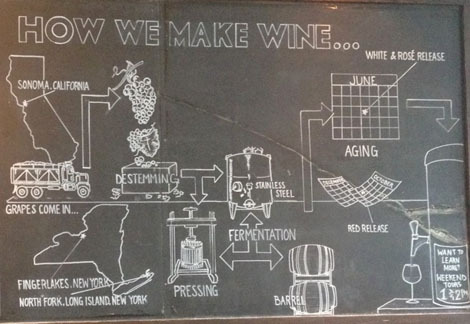 The diagram above explains that they get their grapes for different wines imported from Sonoma, CA, and the Fingerlakes and North Fork of Long Island in NY. I still kind of want to go on a vineyard tour, but I would rather find one that is a winery as well, or has a tasting room, so who knows if it'll happen this summer. Bummer, but I'm glad I got to do tasting on this tour.] Our UO tour guide also gave us information about their wine, and we tasted a stainless steel aged riesling (right), and a cabernet sauvignon (left). I'm not a huge red wine drinker, but this one tasted like blackberries and was pretty good, and the white was crisp and delicious. 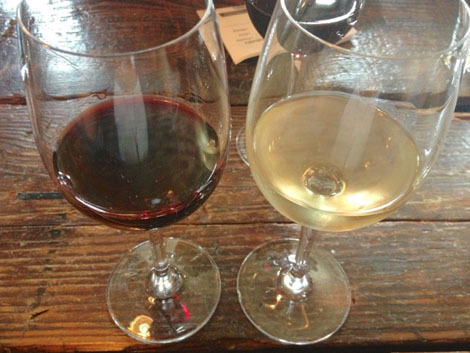 I was extremely pleased with the wine, the tour, the atmosphere, and the music in this place. Also, they do live screenings of Breaking Bad every weekend. I don't watch that show, but I think it's fun that they do stuff like that. However, because this is a small, craft winery, the wine is sooooo expensive, and I don't think I could ever just sit there and enjoy a glass or two of wine at at least $14 a pop. Our last stop was the NY Distilling Co., which was probably my least favorite in terms of drinks, but I liked the actual place a lot. Because you can't serve alcohol in an actual distillery, they built on a tiny attachment called 'the Shanty', where there is a little bar, a few tables, and a lot of alcohol. We got to try the two types of gin that they make on site, Perry's Tot, which is Navy strength gin that burns your throat on it's way down, and Dorothy Parker, an American gin that is slightly less burny and a little tastier, but still not so much my style. They also make whiskey on site, but because whiskey has to age for three years by law and the distillery is only about a year and a half old, it's not ready yet. 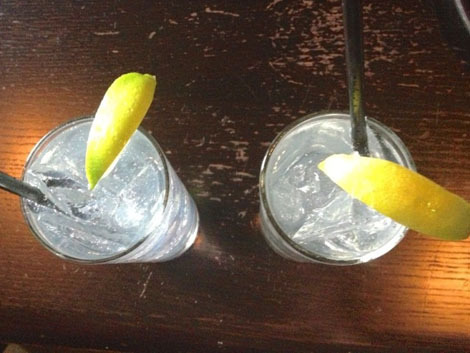 After the two mini shots we were served a 'Tot + Tonic', a classic G+T made with the Perry's Tot. 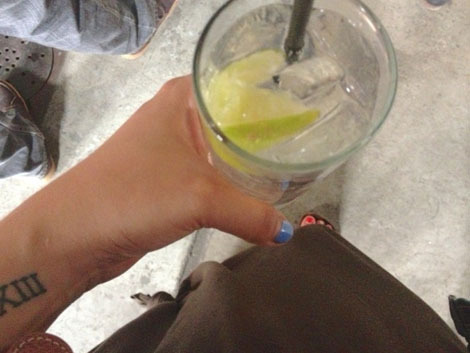 It was really strong, but with another squeeze of lime I think I could have really liked it. This is my drink post lime squeeze, and just a little bit more full than how I left it at the end of the tour. Overall, it was an awesome day, really fun, really boozy, really hipstery Brooklyn (which I secretly love), and R and I got a nice little chunk of time to do something fun on our own. I really recommend doing this tour if you live in NY or are planning on visiting (and are over 21 of course). It is worth the money and definitely a worthy day out.